The near-constant stream of news out of Washington is muddying a "very simple, easy-to-understand story" about President Donald Trump's ties, path to office, and presidency, the New Yorker's Adam Davidson says. Davidson, who previously covered the Iraq War and the 2008 financial crisis, told CNN's Brian Stelter "there's a disconnect" between what journalists and experts know, and what is "getting through" to the public. The story hiding in plain sight that is being "obfuscated by the daily Trump chaos," he said, boils down to "corruption, illegality, [and] engaging bad actors for the profit of Trump and creating a platform for others to profit around him." There is much for the media to glean from Trump's business practices dating back to the 1970s, and the patterns of behavior exhibited by those running the Trump Organization, according to Davidson. In the 1970s, he said, Trump learned from the infamous attorney Roy Cohn that "you say anything at any time to serve your needs in the moment." "This is a man who has openly, joyfully, gleefully, proudly said... the truth is irrelevant," Davidson said about Trump. "Speaking is an act of self-service for him." Cohn served as Senator Joe McCarthy's right-hand man and was the chief inquisitor during the Army-McCarthy hearings. The Trump Organization, Davidson said, "is an organization that had clear, deep, and disturbing and surprising ties to Russia that there clearly was some degree of collusion." "We know that," he said. "And this fact pattern, when you're immersed in it, when you understand it, it's a very simple story." 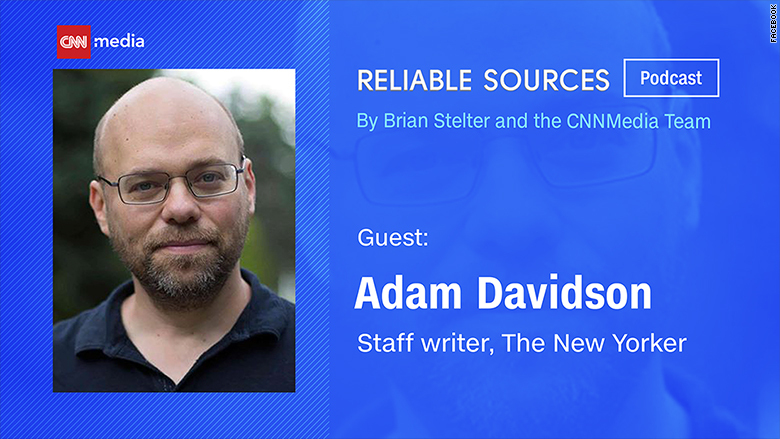 Davidson sat down with Stelter for this week's Reliable Sources podcast to discuss the "big picture" of Trump's presidency that he believes journalists should be tackling. Soon after federal investigators raided the office of Trump's lawyer Michael Cohen, and after news broke that Cohen had been under criminal investigation for months in New York, Davidson wrote a piece for the New Yorker proclaiming that the American public was witnessing the "end stage" of Trump's time in office. "There are a lot of details and surprises to come, but the endgame of this Presidency seems as clear now as those of Iraq and the financial crisis did months before they unfolded," he wrote in the April 14 story. "This doesn't feel like a prophecy; it feels like a simple statement of the apparent truth." "Eventually, you find out that Nixon was a crook," he told Stelter. "Eventually, you find out that the Iraq War was fought on false premises and then the occupation of Iraq was handled poorly. Eventually, you find out that housing prices will not continue to rise forever. And so my strong contention is that this story will come out and it will come out in a way that fundamentally shifts the political dynamics." But getting to the "big picture" of any story about Trump can be difficult for journalists, especially when there are so many tweets, scandals, and scoops to cover. "I don't want to say, 'Oh we should ignore him,' but I do think that there are moments... when I as a journalist, when one as a journalist, can rise above that daily incremental storytelling and say, 'Wait a second, there's probably something you don't understand. Let's explain it to you,'" Davidson told Stelter. Davidson recognized that doing so takes time. But he does think that it's important to take a step back and present news consumers with the opportunity to say, "Oh, now I get it." Davidson turned to Twitter following the podcast taping to further elaborate on the need to put incremental Trump news into a larger context. I am becoming increasingly convinced that the biggest journalistic challenge of the Trump presidency is not uncovering more dirt (though we need to keep doing that). It is more important to make clear what we already know to the low information news consumer. "I am becoming increasingly convinced that the biggest journalistic challenge of the Trump presidency is not uncovering more dirt (though we need to keep doing that)," he wrote. "It is more important to make clear what we already know to the low information news consumer." "I get that I might be fooling myself and that nothing matters anymore and the country is in rigid, defined camps. It's clearly true to some degree. But, there are people who haven't heard it laid out correctly. They want to understand. Let's explain it to them."